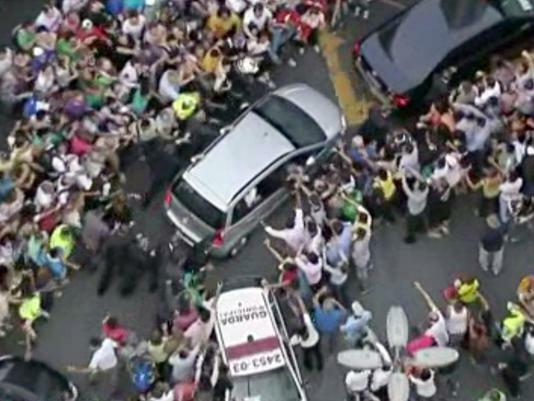 Pope Francis created mayhem in Brazil when the driver of the Fiat he was in made a wrong turn, and his car was mobbed. To the chagrin of security officials, he had traveled simply in a charter flight without the bulletproof popemobile. Word is he carried his own luggage. He still refuses the Papal residence, staying in a modest guesthouse. He dispenses with the fleet of Mercedes Benz (and apparently chauffer), and instead drives a 2008 Ford Focus. At first I had a problem with that. I drive a 2007 Ford Focus. But then I figured – hey, he’s the Pope. It’s okay if his car is newer than mine. This entry was posted in Business, Celebrity, Communications, Culture, History, Humor, Leadership, Media, People, Philosophy, Politics, Religion and tagged Brazil, Fiat, Ford Focus, Mercedes Benz, Pope, Pope Benedict XVI, Pope Francis, Popemobile. Bookmark the permalink.